Making nice with mosquitoes and enjoying quality anti-Malarial side effects. Wearing long sleeve shirts and long pants also help prevent sunburn. At least you get a dividend back when spending hundreds of dollars at REI for breathable clothing and DEET. Enjoy many Gin and Tonics - it is important for you to consume much Quinine. Mosquitoes seem to love ankles, so wearing long socks is a good idea. Do some research before you depart, and get the necessary medicine regimens in place. 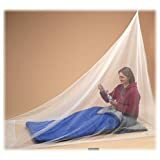 Buy a bed net for folks who live there year round.